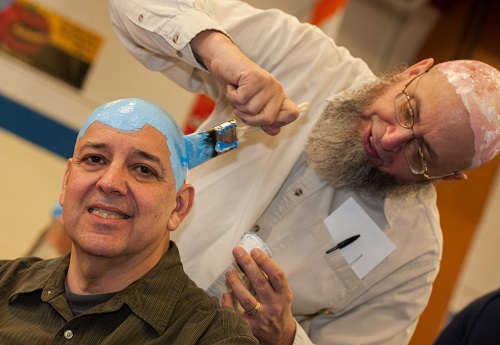 This February, the University of Maine at Presque Isle, C-A-N-C-E-R [Caring Area Neighbors for Cancer Education and Recovery], and community members will celebrate 10 years of close-shaving, head-painting, fundraising planetary fun during the 10th annual Planet Head Day. The region’s most unique fundraiser, which brings together space science education and cancer awareness, will be held on Saturday, February 20, from 11 a.m. to 2 p.m. in the University of Maine at Presque Isle’s Wieden Gymnasium. This not-to-be-missed celebration is free and the public is invited to attend. “Planet Head Day has always worked so well because of the strong support by community leaders in northern Maine,” said event co-organizer with C-A-N-C-E-R Louise Cardone-Calabrese. This year, the first people to have their heads shaved and painted will be city and town managers from the region. These participants will include: Martin Puckett, City Manager from Presque Isle, who will be painted as Earth, and Town Managers David Cyr from Mars Hill (Uranus), Jon Frederick from Mapleton (Mars) and James Risner from Fort Fairfield (Mercury). “Other community leaders have also stepped up so we can field a full collection of planets early in the event,” said Kevin McCartney, event-co-organizer with UMPI, who will himself be painted as Pluto for the 10th year in a row. 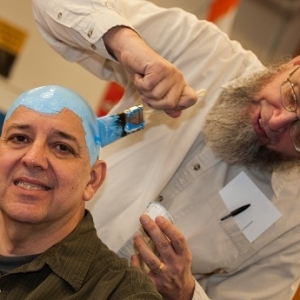 As they do every year, participants will raise money for C-A-N-C-E-R by having their heads shaved and painted as planets, dwarf planets, moons, comets and asteroids. Planet Head Day is the major fundraising event for C-A-N-C-E-R, an Aroostook County-based grassroots organization that assists cancer patients and their families. The event has become one of the most widely known single-day fundraising events in northern Maine. This year, organizers hope to raise about $25,000. Planet Head Day is also part of a NASA-funded celebration of the University’s involvement in the New Horizons space mission to Pluto, a point of special significance as the space craft passed the dwarf planet last June and is now heading into the Kuiper Belt, where it should be visiting other objects in the future. Planet Head Day is held each year near the February 18th anniversary of the discovery of Pluto in 1930. The University’s Northern Maine Museum of Science has always sought imaginative ways to teach science and developed the program to combine science and cancer education into a single package. “This year’s Planet Head Day will be the first time that we will be able to work from actual close-up pictures of the Pluto surface, after New Horizon’s successful mission past the dwarf planet last June. So, there will be less artist’s discretion for my head,” McCartney said. C-A-N-C-E-R board members are excited about this year’s event because of all the support and volunteer efforts. All monies raised during Planet Head Day stay in the County and help those recently diagnosed with cancer or who are in treatment for cancer. C-A-N-C-E-R strives to help patients with travel expenses and other treatment-related expenses. It has also, in special circumstances, helped in other appropriate ways to bridge gaps until other secure agency solutions can be identified. This year’s Planet Head Day will begin at 11 a.m. and continue until 2 p.m. with food, fun, a 50/50 drawing, door prizes, cake, and games for children. The event also provides science and cancer education. The staff of the Parsons Street Barber Shop and Great Beginnings Hair Boutique will be available again this year to provide free haircuts for those willing to shave their heads for the occasion, while “bald” caps will offer a less permanent option for participants. The bald heads that result are in recognition of and support for the many cancer patients who lose their hair during cancer treatment. Last year’s Planet Head Day saw more than 100 “PlanetHeads”, with about half opting for haircuts, and raised about $11,000. PlanetHeads have included community leaders, teachers, pastors, parents, and faculty and students from the University. Many other local businesses and organizations participate in this event, often by raising money in support of one of the PlanetHeads. This year, WAGM has been supporting the event with promotion and interviews that are helping to spread the word. The WAGM-TV 8 news team will be in attendance at the event, helping to raise funds and donning bald caps to transform themselves into planets. Live emceeing will be co-hosted by Michael Gudreau, who will also have his head shaved to become a PlanetHead, and Andrew Hunt. Pizza Hut will once again provide free pizza. The Caribou and Presque Isle Pizza Huts have been raising money ahead of the big day and the manager for the Presque Isle store, Chris Thomas, has pledged to shave his head for the cause. NAPA, in cooperation with Clukey’s Auto Parts, is also a sponsor for this year’s event. As in years past, Lynwood Winslow of Presque Isle will be on hand to take before and after photographs of each PlanetHead so participants can have a keepsake to take home. For more information about participating in the event or to assist with the head painting, contact McCartney at 207-768-9482 or Cardone-Calabrese at 764-0766. For those who cannot attend the festivities, donations can be sent directly to C-A-N-C-E-R, P.O. Box 811, Presque Isle, ME 04769, or call Louise Cardone-Calabrese at 764-0766.